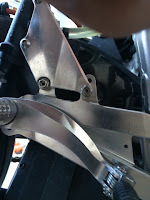 One of the tings I did not like on the bike was the way that the rear brake master cylinder is a 90 degree exit. This means that when you pop on the HRC reservoir kit, it unnecessarily bends round. The older master cylinders have an elbow setup which I think looks smarter. A bit of research and it seems I can swap the 90 degree connector with an elbow connector. The part number is 43503-KS6-701 and will look and function better in my opinion. I have ordered one and as its held in usin a circlip should be an easy change. I have played safe and bought a spare master cylinder to test the conversion.